When we researched Kuala Lumpur, and read out the various things to see to the boys, Declan was very taken with the idea of a butterfly farm. He remembers the one in Cairns with fondness, and impressed a very nice lady in the Smithsonian in Washington with his superior knowledge of moths and butterflies. 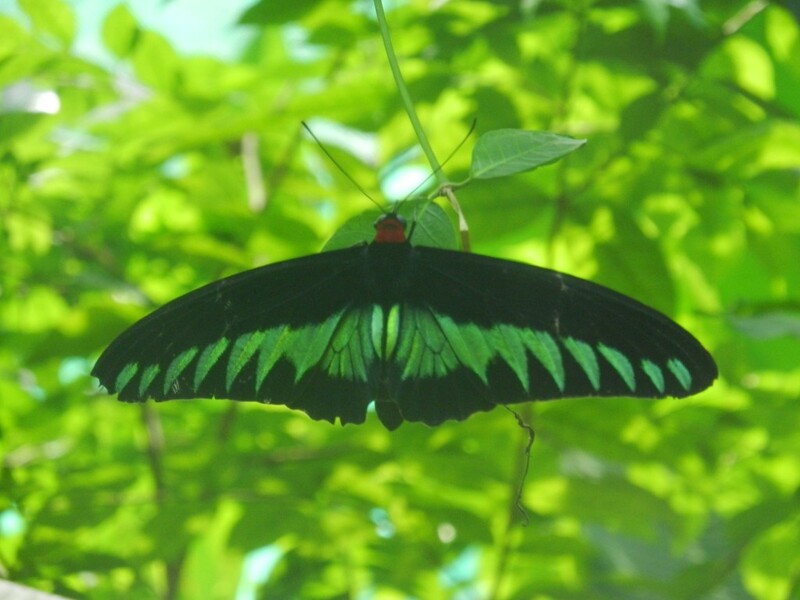 So with Evan indisposed, the three of us decided that our activity today would be the Kuala Lumpur Butterfly Park. We were very proud of ourselves for navigating there by public transport; the train was quite straightforward, but figuring out how to walk the kilometre or so there (while avoiding the numerous freeways in the way) was quite tricky. The butterflies themselves were lovely, but the boys were quite upset with some of the other exhibits. First to displease them was a very small glass tank with a very large turtle, which was trying in vain to swim through the corner someone had tapped upon a few seconds earlier. And then the section after the butterfly farm itself was full of dead butterflies and insects pinned to the wall with explanations of various parts of the butterfly lifecycle. Declan in particular, who never likes stuffed animals at the best of time, found the whole thing very hard to take. As we left, both boys were quite disgusted with the whole thing, deciding that the number of dead things quite outweighed the beautiful live butterflies they had seen, and scoring the farm at around one or two out of ten. I suspect that the memories of the live butterflies, fish and turtles they saw will eventually outweigh their sadness at the dead insects at the end, but it took a quick stop for donuts and freshly squeezed juice to cheer them up again.